reduces potential health-effect contaminants and destroys microorganisms. A solid block of activated carbon effectively removes more than 140 potential health-effect contaminants, while the eSpring UV light destroys microorganisms. Cost assumes use of 1,320 gallons per year. Subsequent annual cost based on replacement filter purchase. The eSpring® Water Purifier improves the taste, odor, and clarity of 1,320 gallons of water, enough for a family of six to cook and drink with, for one year. The carbon-block filter reduces more than 140 potential health-effect contaminants - like pesticides, VOCs, mercury, and lead - yet allows beneficial minerals like calcium and magnesium to pass through. The UV bulb destroys microorganisms in drinking water without the use of chemicals. The eSpring Water Purifier is certified by NSF International and has earned a Gold Seal from the Water Quality Association. Learn more about water quality analysis through the National Testing Laboratories (PDF). The below-counter unit is about the size of a coffee maker. The system includes a dedicated faucet that installs in the soap dispenser or sprayer opening in your sink. Installation may require a plumber as you need a connection to your cold water pipe under the sink. See the eSpring home page for tools, resources, and education. The eSpring Water Purifier comes with a pre-installed carbon and UV filter cartridge (10-0186) that will last 1 year or 1,320 gallons, whichever comes first. Reduces over 140 potential health-related contaminants. No system reduces more. Standard 42: Improves taste, odor, and clarity. Standard 53: Reduces health-effect contaminants. Standard 55B: Reduces microorganisms with UV light. Has earned the Water Quality Association's Gold Seal for superior consumer water treatment products. Works well at all household water pressures, from very low to very high. The cartridge is designed to serve the average cooking and drinking water needs for a family of six for one year or 1,320 gallons, whichever comes first. Cost-effective: The cost per gallon in the second year is less than 13 cents. Patented monitoring system lets you know the carbon filter and UV bulb are working, and when it's time for the annual cartridge change. Changing the cartridge requires no special tools and is as simple as changing a light bulb. The UV bulb inside the cartridge switches on only when you turn on the tap, so water flows cold, not warmed by the UV light. Comes with a two-year limited warranty on parts and labor. And a refund within 120 days of your purchase if you're not completely and utterly satisfied. Housing height: 12-3/4 in. Diameter: 6-3/4 in. Materials: All materials meet U.S. FDA requirements for use in transmitting fluids for human consumption. Constructed of durable, high-impact plastic. For use with potable water supplies. Maximum water temperature: 86 degrees F.
Electrical requirements: 120v, 1.8A/50-60 Hz. This in-home water treatment system, with a patented carbon-block filter and UV light, effectively reduces potential health-effect impurities and effectively destroys microorganisms. This unit comes with the NEW ergonomically improved eSpring® Auxiliary Faucet Kit with signature logo at the base, a high-style design for the best modern kitchens. The eSpring® UV Water Purifier improves the taste, odor, and clarity of up to 1,320 gallons of water, enough for a family of six to drink and cook with for one year. * Rigorous testing has shown that the carbon-block filter effectively reduces more than 140 potential health-effect impurities – like pesticides, VOCs, mercury, and lead – yet allows beneficial minerals like calcium and magnesium to pass through. The UV bulb destroys up to 99.9999% of bacteria, 99.99% of viruses, and 99.95% of cysts in drinking water without the use of chemicals. 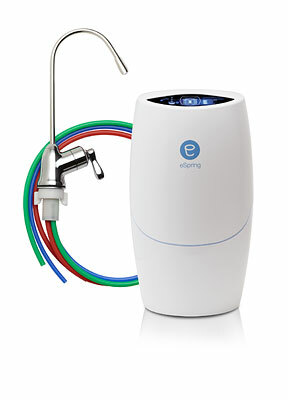 The eSpring Water Purifier is certified by NSF International(NSF/ANSI Standards 42, 53, 55B and 401) and has earned the Gold Seal from the Water Quality Association. *Actual filter life depends on usage and water quality. Improves taste, odor, and clarity. Testing shows eSpring® effectively reduces pharmaceuticals Atenolol and Ethinyl Estradiol (17-alpha ethynyl estradiol), which could potentially be in your drinking water. Cost-effective: The cost per gallon in the second year is 16 cents. Changing the cartridge is simple and requires no special tools. Comes with a three-year warranty. **Restrictions apply. Visit Amway.com and search Satisfaction Guarantee for more details. Note: The UV lamp in the filter cartridge contains mercury. Please dispose of according to local, state, or federal laws. or use with potable water supplies. Can I connect my Below Counter eSpring® UV Water Purifier (10-0189) to my refrigerator’s ice maker? Yes. You’ll need to purchase the Single Line Faucet / Ice Maker Conversion Kit (10-1398). This kit includes a pressure regulator and all the fittings you’ll need to connect your eSpring® UV Water Purifier to your refrigerator’s ice maker, except for pressurized 1/4 inch (6 mm) OD tubing, available from almost any local plumbing supply or hardware store. Be sure to use tubing that is certified for use in drinking water applications and follow the instructions in the Owner’s Manual. Can I still continue to use the unit without changing the filter when I’m supposed to? It is not recommended. The filter life is determined based on performance testing. Failure to maintain the unit as recommended may impair the performance. Can water damage the UV bulb? No, the UV bulb is completely sealed in a quartz sleeve within the carbon block and is not directly in contact with the water. It uses a wireless (inductive coupled) connection to power the lamp, much like the recharging unit for an electric toothbrush. An added feature users will appreciate: The light comes on only when water is flowing through the unit, so the treated water is not warmed by the light. Can ultraviolet light make the water radioactive? No. While the water in the eSpring® UV Water Purifier is exposed to ultraviolet light, ultraviolet light is not radioactive. Therefore, it is impossible for the water to become radioactive. Does the eSpring® unit change the taste of water? The taste of water depends on what’s in the water. The eSpring® UV Water Purifier will effectively reduce many impurities, like chlorine, that affect taste and odor, and will improve the clarity of water. 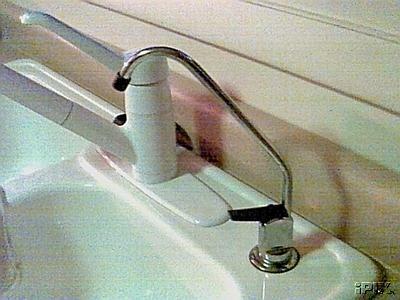 It is installed under the sink and connected to a dedicated faucet. I’m not mechanically inclined, so I’m not sure I could install the unit myself. How difficult is installation? The Below Counter model has a dedicated faucet that you can insert into any available opening in your sink, such as an opening for a soap dispenser. Installation may require a plumber as you need a connection to your cold water pipe under the sink. It also requires an outlet with continuous power. How will I know when it’s time to change the filter? Is it hard to change? No. The patented, easily replaceable eSpring® replacement cartridge screws in like a lightbulb and lasts for up to 1,320 gallons or one year, whichever comes first. * And the eSpring® unit monitor automatically resets itself when the filter is replaced. It’s simple. I have the Ice Maker Hookup Kit attached to my Below Counter eSpring® unit. How do I flush my new filter after a change with this setup? You will first need to disconnect the line from the refrigerator at the tee. Then, flush your cartridge into a bucket, as outlined in the instruction manual, before reconnecting. For further assistance, please Contact Customer Support at 800-253-6500 Monday-Friday, 8 a.m. to 11 p.m. ET, and Saturday, 9 a.m. to 5 p.m. Does the eSpring® UV Water Purifier reduce pharmaceutical by-products? Ethinyl Estradiol (17-alpha ethynyl estradiol) or EE2.